Rain gutters installed by ABC Seamless of Albuquerque offer your home unprecedented protection when the forceful rain patterns in New Mexico and throughout the southwest strike. Our durable gutters are precisely measured, cut, and manufactured on-site at your home to ensure a seamless fit, and they are 30 percent wider than traditional K-style rain gutters, allowing them to handle more rainfall and properly redirect that water away from your home’s foundation. And because we offer a wide range of complementary gutter products, from downspouts and collectors to gutter guards in coordinating colors, you can be sure that your home will be as visually appealing as it is protected with one of our new gutter systems installed. You have your choice of 5-inch or 6-inch seamless designer gutters and downspouts to effectively channel even the heaviest rainfall safely into a rain barrel or away from your home’s foundation. You’ll have your choice of attractive copper, steel, or aluminum gutter construction. Our seamless rain gutters will blend in with your home’s soffit and fascia systems to create a unified appearance. 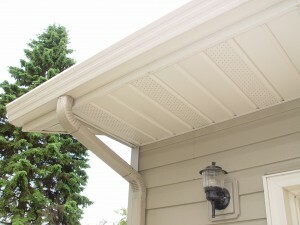 Our maintenance-free gutters require no painting. Additionally, we’ve been in business since 1989, so we understand the requirements of unique New Mexico architecture. For Albuquerque, NM, homes with flat roofs, we know that proper water drainage is important to prevent moisture damage to valuable stucco, which is why, in addition to rain gutters, we also offer custom-made parapet caps available in a wide array of colors to protect your stucco from standing water. Plus, we offer attractive rain barrels to collect water and provide you with non-potable water that you can use for eco-friendly landscape maintenance. To learn more about the exceptional rain gutters and other products we offer to protect your home in Albuquerque, NM, contact ABC Seamless of Albuquerque today. Feel free to stop by our showroom or schedule a complimentary at-home consultation.